Economic commentators and analysts expect the Indian economy to clock another round of robust gross domestic product (GDP) growth in the quarter ended September, following an impressive 8.2% growth in the April-June quarter. However, this headline figure could be masking significant economic vulnerabilities, according to the Mint Macroeconomic Tracker. Launched last month, the tracker uses 16 high-frequency indicators to gauge the health of the Indian economy. 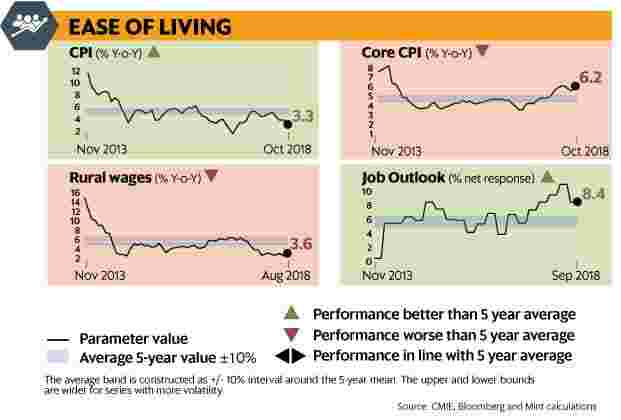 According to latest figures, nine of the 16 indicators are in the red—performing worse than the five-year trend. 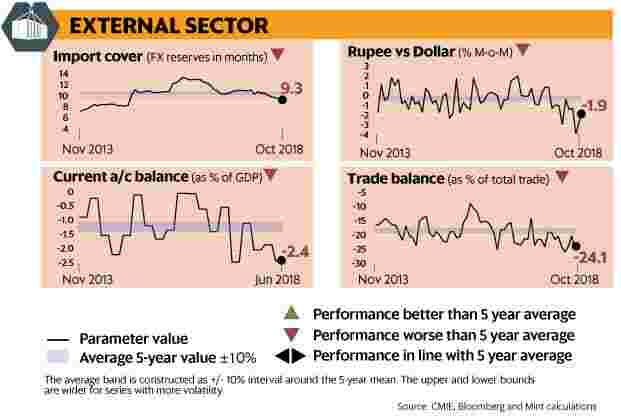 The biggest concerns are in the external sector where all four indicators continue to perform below the five-year trends even with recent positive developments. The rupee, which depreciated 17% since the beginning of the year to its peak of 74.4 to a dollar in mid-October, has regained some strength, appreciating by 5% to 70.78 as on Wednesday. At the same time, retail prices of both petrol and diesel have fallen by 9% and 7%, respectively. These developments should contain India’s burgeoning current account deficit (CAD). In 2017-18, India’s CAD had widened to 1.9% of GDP from 0.6% in 2016-17. With oil prices coming off from $86 per barrel to close to $61 per barrel, the FY19 CAD could be better than many earlier expected. For instance, a recent SBI research report lowered its expectation of CAD to 2.6% of GDP in FY19 from its previous estimate of 2.8%. The respite couldn’t have come at a better time for Prime Minister Narendra Modi’s government, which is trying to douse fire on various fronts—a banking system saddled with bad loans, a near-crisis in the non-banking financial system and mounting tensions with the Reserve Bank of India (RBI)— ahead of the upcoming general elections in 2019. But the relief may prove to be temporary. Crude oil prices remain volatile and could rise again as the US is expected to continue to tighten the screws on Tehran through sanctions on oil exports. Other vulnerabilities in India’s external sector also remain. India’s non-oil trade balance as a percentage of total non-oil trade has increased to 15% so far in the current fiscal year from 14% in fiscal year 2017 and 10% in fiscal year 2016. At the same time, India’s import cover of foreign exchange reserves has fallen below the five-year trend range in recent months. Import cover of reserves is an indicator of foreign exchange reserve adequacy and measures how long imports can be sustained in the event of a shock. Meanwhile, global trade tensions pose further risks to India’s exports, which have already declined as a share of India’s GDP in the last couple of months. Thus, relying on falling oil prices to improve external sector performance could prove risky when, instead, serious structural reforms are needed . Another potential area of concern is consumer activity. 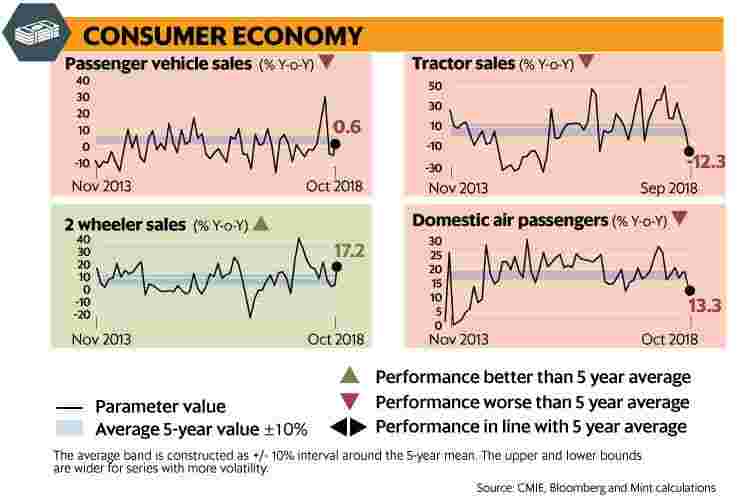 Growth in passenger vehicle sales, tractor sales and domestic air passengers are all below five-year trends. And while, two-wheeler sales outperformed trend growth, this is partly a reflection of underperformance in the base year. However, one area where the economy is doing better is industry. Industrial production in the economy continued to grow at a healthy pace during the July-September quarter and in the subsequent month. The Purchasing Managers’ Index (PMI) for manufacturing improved for the second successive month to 53.1 in October. A PMI reading of above 50 indicates expansion in manufacturing activity, while a reading below 50 indicates contraction, and readings over the last two months have been significantly above the five-year trend. 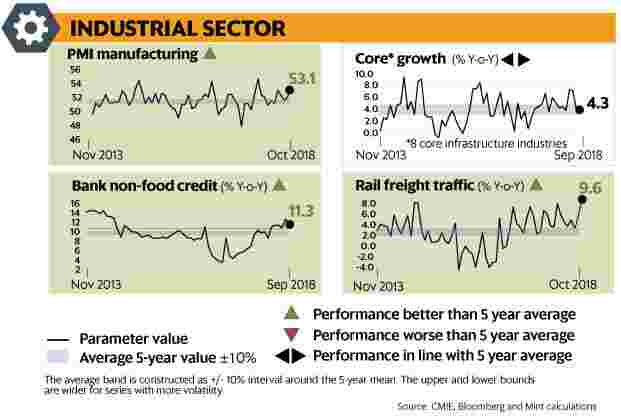 Similarly, growth in bank credit to industries was above the five-year trend, while growth in India’s key infrastructure industries at 4.3% in September was in line with the five-year trend. Another positive is the job outlook as captured in the RBI’s quarterly survey which has been better than the five-year trend since July last year. A recent analysis by Mint showed that corporate job growth has recovered sharply in the past couple of years. However the pace of growth remains lower when compared with the fiscal year 2006-09 boom phase. Also, while corporate employment may be recovering, rural wages are still below five-year trends. Taken together, Mint’s Macroeconomic Tracker, even after some recent good news, highlights significant issues in the Indian economy. Addressing the external sector constraints, creating job opportunities, attracting more investment and maintaining a healthy fiscal deficit during an election year will be major challenges for the Modi administration as it heads into the final lap of its current tenure.